I might not be the next Annie Leibovitz; but I’ve definitely been improving my photo skills in the past year. It’s a fun adventure (and an expensive habit buying new lenses, etc!). I discovered that Yahoo! 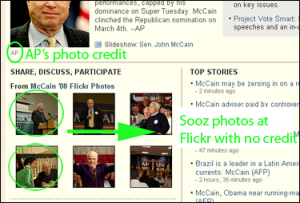 News is using two photos (1, 2) I took of John McCain (in 2005 when he spoke at a … Continue reading "The Evolving Photographer And Her Quest For Photo Credits"